Paris counts around 500 fountains and it was not easy to make a selection of my favourites and write a post about my top five fountains in Paris. I had others or more in mind but some of them were not in working order when I have seen them… and personally I cannot consider a fountain without water as a real fountain, especially in summer when the sun is at last shining! So here is my selection of five amazing fountains, each of them being a work of art and offering a peaceful and refreshing break in Paris. Enjoy! 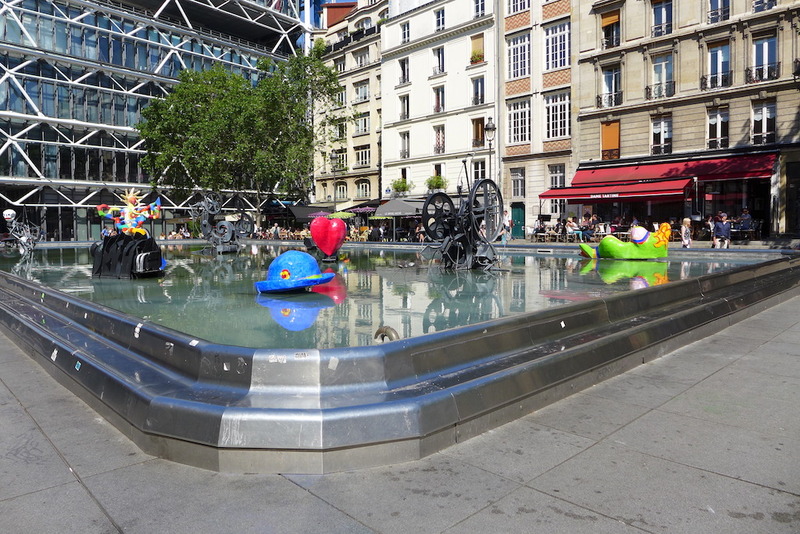 The ‘Fontaine Stravinsky’, also called ‘Fontaine des Automates’ was ordered in 1983 by the City of Paris and the French Ministry of Culture to two famous artists: Jean Tinguely and Niki de Saint Phalle. They were not only both painters and sculptors at once but also husband and wife. The sponsor of the project is Pierre Boulez, the famous French composer who was also the manager of the IRCAM: he asked the artists to design a fountain in tribute to the Russian composer Igor Stravinsky.